Don't feed dogs and cats table scraps. Gravy, fats and poultry skin can cause life-threatening conditions like pancreatitis and gastrointestinal problems. Bones can splinter and create bowel obstructions. Be wary of holiday decorations; pets often consume them. Remember to unplug decorations to avoid electrocution hazards. Chocolate is an essential part of the holidays for many people, but it is important that it be kept away from pets. Chocolate contains theobromine, which is toxic to dogs and cats. The darker the chocolate (baking chocolate being the darkest) the more dangerous it is to pets. 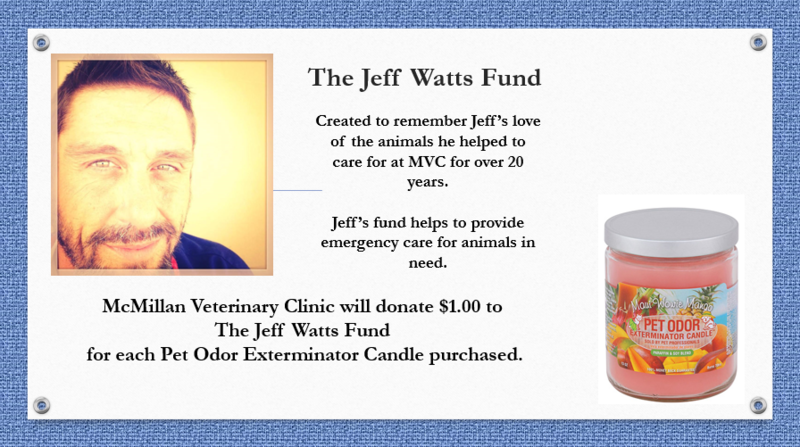 The Jeff Watts Memorial Fund. Donations may be sent, or taken directly, to Sumner Bank and Trust, 240 West Broadway, Gallatin, TN 37066. Jeff's family, Sumner Bank and Trust, and McMillan Veterinary Clinic will work together to ensure all proceeds of the memorial fund will be used to assist pets in need of proper medical care to honor Jeff and his love of animals.